My trip now includes a flight to Riga and a bus to Tallinn. I'm lucky to have adventurous cousins in Vilnius meeting me for that portion. It's going to be jam-packed but fun, and since the tickets were such an impulse purchase to begin with, I don't feel too bad about giving Copenhagen less than the full 9 days. Anyway, I tested the list below in my S25, and it rang it at 11lbs (so 5kg or so?). It will end up being a little heavier because I forgot to weigh a few small items like my glasses and contacts. My purse is about the size of a PCSB, and should come in around 2lbs when packed up (wallet, passport, phone/charger, Kindle, ear buds, and a couple other necessities). On the plane I'll be wearing dark jeans, with a grey T, olive cashmere sweater, a cute scarf and motorcycle boots, plus compression socks which I just discovered, and don't know how I did trans-Atlantic flights without. I'm bringing/wearing a trench with a hood, and gloves/toque in the pockets. There should be enough room left over in the main compartment of the S25 to stash the outerwear. dark jeans, with a grey T, olive cashmere sweater, a cute scarf and motorcycle boots, plus compression socks... trench with a hood, and gloves/toque in the pockets. It's a little out of my comfort zone, honestly, but I got inspiration from this list/site. Another thumbs up for your packing list - eerily close to the one I'm using for a quick trip to Seattle & Boise next week! Amazing list for 9 days. Only the one pair of shoes (boots)? You’ll have to post some pictures! I'll have two: wearing one, packing one. I'm too afraid to go w/ just one pair. I’ve always wanted to see Vilnius, and not just because I’ve probably watched The Hunt For Red October 600 times. Lol. Copenhagen is awesome. Tallinn is awesome. Riga is totally on my bucket list so I want to hear all about. Great destinations! I've only been to Copenhagen and I loved it! And I'm really impressed by your minimalist approach. Being a rather maximalist traveller always prepared for all kinds of eventualities I would certainly take my A45 (if not more) and the S25 as my purse! Enjoy your trip! Great capsule! Travel Fashion Girl is a great resource. Ditto. I take three pairs for any trip longer than 36 hours: a spare walking/working shoe AND comfy sandals for the hotel/house/pool/spa. Totally worth it for the comfort. 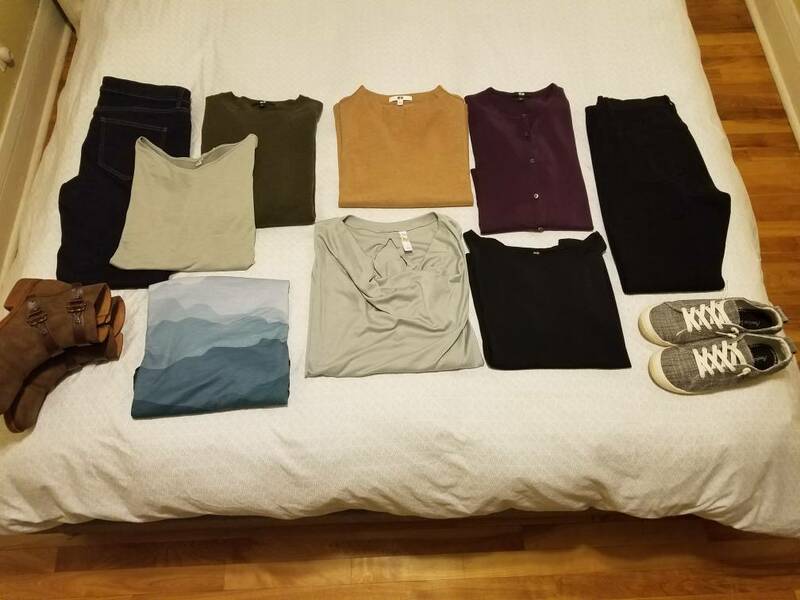 Would love to see a flat lay picture of the clothing you’ve chosen! It’s so intriguing to imagine you’ll be able to mix and match everything. as soon as I clear the dog fur off the duvet, I will try to oblige! Left hand side is the jeans, T, sweater, scarf and boots I'll be wearing on the plane. The rest will be packed... didn't include socks and undies, as I don't think that's relevant LOL. P.S. The lighting in my bedroom is terrible, so I'll say the sweater I'll be wearing is a dark olive and the one next to it is nowhere near as orangey as it looks--much more a true camel brown. P.P.S. Just realized everything but the scarf, shoes, and long sleeved top is Uniqlo. Last edited by kathryn; 02-09-2019 at 04:03 PM.